One perplexed Fed watcher recently observed that “Fed policy. . .is maddeningly disconnected from their [sic] forecasts.” After all, how can the Fed legitimately be concerned about unemployment and low inflation while simultaneously winding down bond purchases? 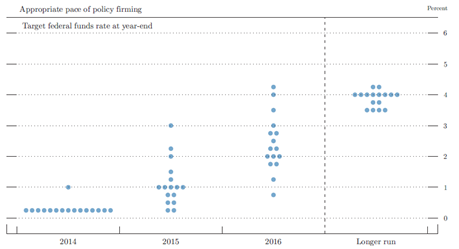 How can it promise low and gradual rates well past the end of tapering while internal data show committee members’ expectations for rates past 2016 in the 4% range? (Assuming a mid-2015 start to rate hikes, that implies a 50 basis point hike every quarter for 8 quarters straight!) The Fed still talks a lot like a dove but is acting increasingly like a hawk. The answer to this paradox lies in how forward guidance works and it’s an important reason the Fed’s message appears so confusing to some observers right now. Self admittedly, the Fed has been playing a sort of game of chicken with monetary policy, using unemployment and inflation targets to credibly commit to low rates well beyond what most models would suggest is prudent from a price stability standpoint (or in Paul Krugman’s words they’re making a credible promise to be irresponsible). In doing so, the Fed’s ‘lower-for-longer’ policy on rates has been very effective at easing financial conditions despite its inability to lower the fed funds rate any further. the Fed can’t really be irresponsible; it can only pretend to be so as a short-term policy tool. And that’s what important here – forward guidance is only a policy tool, a way to influence market expectations. It is only useful until it’s not, at which point the Fed can (and by charter must) abandon it. Furthermore, the Fed’s incentives change over time as well. At some point, the Fed is confronted with the costs of keeping its commitment (latent inflation) while the benefits of that commitment (looser monetary conditions – and hence greater economic growth – than would have otherwise been possible) have already largely been enjoyed in the past. There comes a time when the economic value of the promises it has made is not as valuable as the flexibility it will need in the future; in other words it has gotten from forward guidance most of what it thinks it can in terms of job growth and needs to be in a position to quickly change course should that job growth lead to inflationary pressures. It is then faced with reneging on its previous commitment. The Fed must break one promise in other to keep another and it must do so while maintaining policy-making credibility. We believe we are at that crossroads now and the torturous process of transition will be confusing to markets for some time. The Fed can only accomplish so much more on the employment front but could be dangerously constrained if inflation rears its head. In some ways, strong evidence of inflation would make that process much easier – the Fed could say ‘look!, we need to put out the fire’ – but the long time delay between monetary stimulus and inflationary pressure means that by the time inflation emerges, the Fed would be well behind the ball in containing it. As long as inflation remains low, the Fed can continue to gradually move away from its forward guidance promises. It can creep toward more flexibility, which we saw much of in Yellen’s March statement. It can slowly walk away from the language of strict and static thresholds in favor of the more discretionary “wide-range-of-information” language that emerged in March. It can even continue repeating it’s lower-for-longer mantra in the face of internal projections that show quite a different course in the medium term. However, should inflation rear its head convincing policy makers that they are well behind the curve, there is no reason to think they won’t abandon ‘lower for longer’ and promises of gradualism they’ve continued to make as they ease away from forward guidance. Ultimately, there is one overwhelming reason the Fed would move to this next stage of guidance; it’s worried that the costs of its commitment now outweigh whatever further benefits may come from it. Were it convinced it hadn’t done enough to stimulate growth and employment, or that it could do substantially more, it almost certainly would not have begun the tapering program and tightening message that it has. By this measure, inflation is the most meaningful metric guiding Fed policy right now. Should inflation remain benign, the Fed will have ample time to message this change in policy. Should inflation surprise on the upside, however, all bets are off. The big disconnect between what the Fed is saying and what it is doing is just a reflection of a central bank grappling with how best to break its previous commitments under forward guidance without roiling markets. After all, it’s uncomfortable to admit to your host that you forgot to bring desert after you’ve already finished dinner. We don’t expect this part of the exit from quantitative easing to be particularly smooth and should inflation rear its head, the more dramatic change in course at the Fed will be particularly rough.